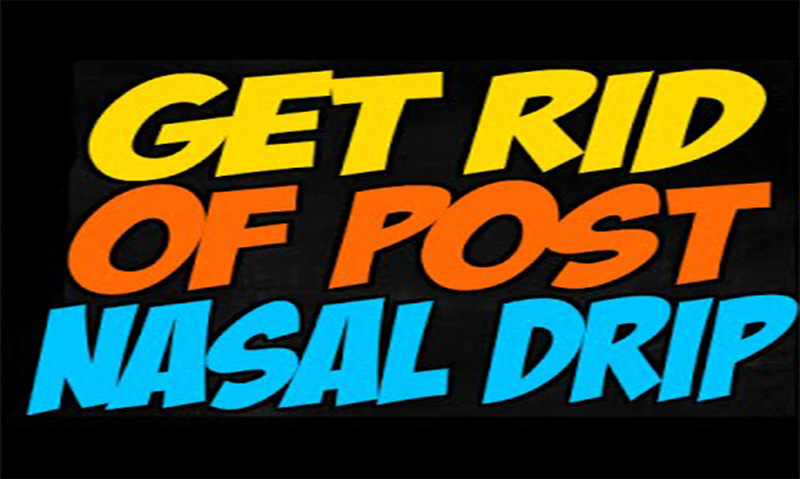 Postnasal drip can be a never-ending nightmare, trust me I know, I once was a sufferer. Only Stephen King could have come up with a better script, nonstop globs of mucus dripping down my throat, waking up in the middle of the night breathless, non-stop coughing and constant bouts of swollen tonsils. Finding a remedy for this condition was quite a challenge as nothing I tried worked. It’s when the glands in your nose and throat continually produce excessive mucus. This excess mucus accumulates and drips in the throat or the back of the nose. Now mucus production is necessary as it moistens and cleans the nasal membranes, humidifies the air, while also trapping and clearing inhaled foreign matter, and fighting infection. Neti Pot – it did clean out my nasal passages, but it did nothing to stop my postnasal drip. Saline Nasal spray – This seemed to alleviate my symptoms a little, but it didn’t stop the excessive mucus production, and I kept waking up in the middle of the night with loss of breath and a horrible cough. Naturade Expectorant – This seems to help a little in terms of temporarily ridding my lungs of mucus, but did nothing for my nasal passages that were dumping the mucus in my lungs. After hitting a dead end with these four so-called remedies, I gave up looking for a cure. There was another option, but there’s no way I was going to turn to pharmaceuticals, and even if I did, they didn’t have a remedy either, just harmful franken-pills to alleviate symptoms. So I relegated myself to suffering and decided to just live with it. Months later fate was in my favor and I discovered one of natures most powerful anti-viral and anti-bacterial plant derivatives, wild harvested oil of oregano procured by this company North American Herb & Spice. Trust me wild harvested oil of oregano is worth its weight in gold. Becoming a fan of North American Herbs P73 Oil of Oregano, I started to browse their website for other products, and I found SinuOrega. SinuOrega is an oil of oregano nasal spray, being I knew the far-reaching healing capabilities of oil of oregano I decided to try it for my post nasal drip. When I first applied the spray in both nostrils and inhaled as the directions stated, I nearly fell on my back because of its strong burning sensation. Incredibly I felt immediate relief and the following night I almost slept undisturbed, I didn’t wake up with shortness of breath, and I had very little coughing. The following day I applied it twice, once in the mourning and once in the evening, and I slept throughout the night undisturbed and my postnasal drip symptoms disappeared permanently. A friend of mine had a nasal infection for about 2 months that wouldn’t subside. None of the antibiotics she was administered eradicated the bacterial infection nor gave her any relief of symptoms. I told her about SinuOrega and suggested she should try it. She took my advice and within 4 days of using SinuOrega her horrible nasal infection disappeared never to return. After being healed my friend became an ardent believer of SinuOrega . She informed me that she recommended it to a friend of her’s who suffered from Anosmia (lost sense of smell) as a result of snorting cocaine for many years. The friend was given steroids by doctors, but the condition would not improve. She said the friend tried the SinuOrega , and after a couple of applications, her friend regained their sense of smell. Oddly the first thing the friend smelt was the aroma from being on the toilet, and she said the friend shed tears of joy. Truly the healing capabilities of Wild harvested Oil of Oregano are wide and far-reaching! Thank you! I appreciate your words!